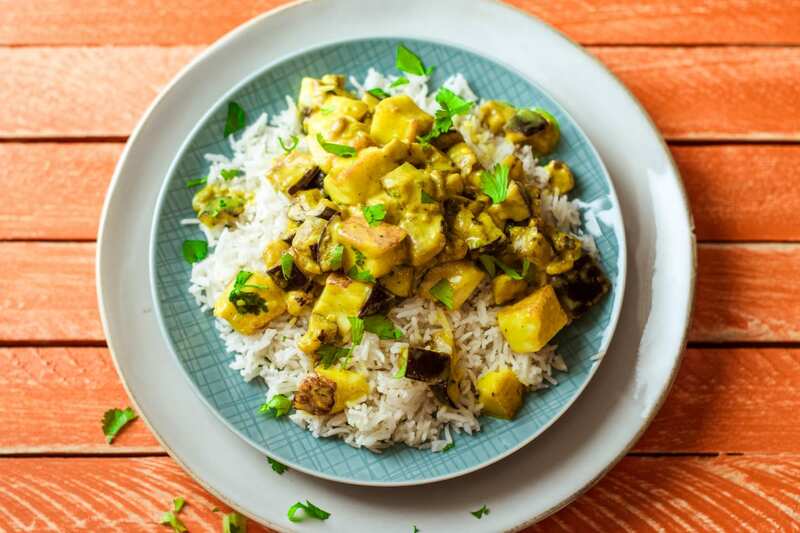 Paneer is a type of cheese used in a lot of Indian cooking, when fried it provides a lovely crispy texture on the outside, whilst also soaking up the flavour of the curry. Delicious! 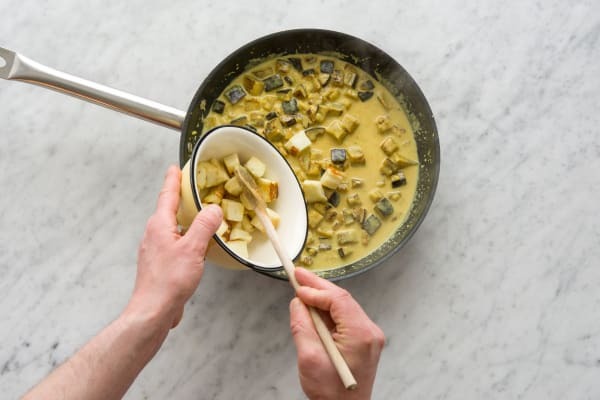 Chop the paneer into 1cm cubes. 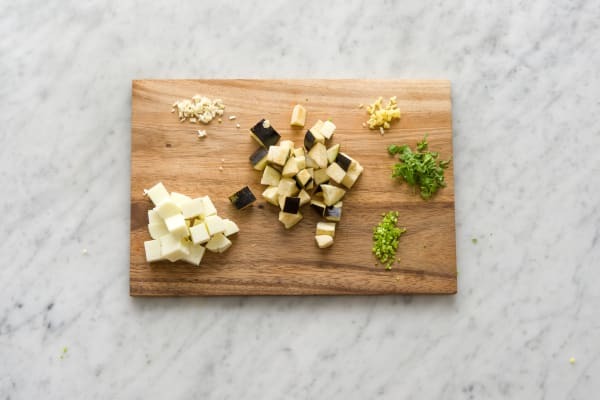 Cut the aubergine in half lengthways, slice into thin strips and then chop into roughly 1cm pieces as well. Peel the ginger (you can do this with a spoon! ), peel the garlic and then grate both of these. Finely chop the coriander stalks and roughly chop the leaves, keep them separate. Pour the water (as specified in the ingredient table above) into a pot and bring to the boil with a good pinch of salt and the cinnamon stick. Once boiling, pour in the rice, reduce the heat slightly, put your lid on the pot and cook for 10 mins. Then take the pot off the heat and leave for a further 10 mins with the lid on. Tip: If the rice is finished before everything else, don’t worry it will keep warm in the pot! 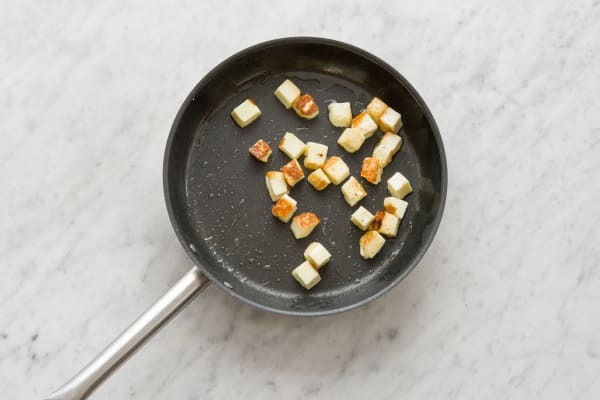 Add a good splash of oil to a large frying pan and add in your paneer chunks. Sprinkle over a pinch of salt, a good grind of pepper and cook for 5-6 mins on medium-high heat until slightly golden. Remove from the pan with a slotted spoon and put on some kitchen paper to absorb any excess oil. 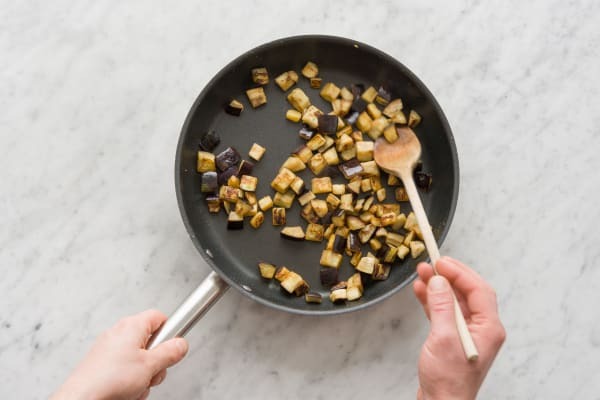 Add your aubergine to the frying pan (no need to wash up your pan) with a splash more oil if you feel the pan is a bit dry and cook for 4-5 mins (still on medium-high heat) until the aubergine is lovely and golden. Add the Goan xacuti spice, ginger, garlic and coriander stalks. Cook for 1 minute, then add the coconut milk. Fill up the tin with water and pour this in too. Sprinkle in a good pinch of salt and another good grind of pepper. Reduce the heat to medium. Simmer the sauce gently for 10 mins, then add in your paneer and half your coriander leaves. Cook for a further 2 mins. Tip: If all your liquid has evaporated, just add a splash more water. Once your curry is ready, serve your rice in bowls (remember to remove your cinnamon stick!) with your curry on top and a sprinkling of your remaining coriander. Enjoy!